Concord, New Hampshire—The Concord Boys & Girls Club in Concord, New Hampshire, helps young people develop into responsible adults by providing them with a safe place to belong, caring mentors, and enriching opportunities. The club facilitates small-group programs and daily activities for 1,200 children a year, providing them with homework assistance, service projects, health and life skills programming, career exploration, arts education, and physical fitness activities. Carol Morse, development director, was looking for a different way to fundraise for the club. The organization's grant writer had hit a wall, special events required a great deal of effort to put together, and federal funding had all but vanished. Morse feared that the club would soon have to be turning away the very children it meant to serve by requiring them to pay the minimal weekly membership fee of $5. "If we had launched a capital campaign then, we wouldn't have been able to get a new door knob, let alone a new building," Morse jokes. Then Morse learned about Benevon from a team member of a neighbor club, and decided to have him pitch the model to the board. "He had such excitement when talking about it," she recalls. "He told us, 'This is a magic formula here. You're going to be under-whelmed by the content because it's really so simple, but the implementation and structure and developing an infrastructure for fundraising is so exciting.'" The pitch worked, and a team attended Benevon 101. The team's first task was to develop its Point of Entry, "Discovery Hour." Morse says that creating the tour was enormously helpful. "Coming up with the buckets, thinking about stories to tell and how to frame them has probably been the best thing we've gotten out of this whole process. We finally had the structure to sit down and say, 'What is it that we do?' Before we had to answer that question depending on who we were talking to. This helped us come up with some general categories that everyone can relate to, and we can use again and again," Morse says. "The buckets have really helped us to hone our message." Their three buckets, "mentors, a safe place, and opportunities," are each introduced by way of a story. 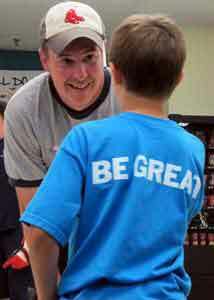 The team worked with coaches to learn the most effective ways to tell stories, which is evident as Morse shares one from the club's Point of Entry about a boy named Neil. Morse easily conjures up the flesh and blood Neil by noting the details of his round face, glasses, and hunched posture, explaining the back-story of how he was endlessly targeted at school by peers, even acting out dialogue between herself and the boy; she switches seamlessly from her own voice to the nasally, dejected voice of the young boy who found a safe haven at the club. Telling stories didn't come as naturally to the club's CEO. Team members urged him to share his own story, but for over a year the reserved leader preferred to discuss figures and statistics. That all changed with the Visionary Leader's meeting at Benevon 201. Emerging from the meeting, the CEO finally had the confidence to share his story. The transformation in the club's CEO was profoundly affecting for team members. "It was the first time he showed he cared without inhibitions," Morse says. "It was amazing for us to see because the team needs to know why the CEO is doing this work. He learned that showing emotion helps you connect to other people. He just needed a little help to express himself." "It's easy to stay with what's been working and not think outside of the box to dream for more," notes CEO Chris Emond. "This process has been a great exercise for all of us to push ourselves to try things differently." The CEO was still nervous to speak in front of so many people at the Ask Event. Morse reminded him the intention of telling stories, which in her words is "sharing vs. exploiting for the sake of raising money." The club's Ask Events have reflected that distinction. At the event, team members show video testimonials that feature children in a positive way. Morse says the video is extremely powerful, and has caused guests to thank their Table Captains for inviting them. "No matter how many times I watch it, it still makes me cry, thinking about the work we've done here," Morse reflects. 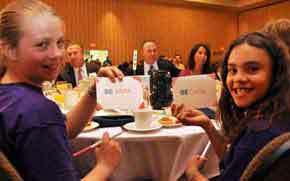 The Concord Boys & Girls Club raised $300,000 at its first Ask Event, and $170,000 at its second. "It was just so obvious that people had never been asked," Morse says. "The model gave us the framework to ask for certain amounts—we would never have had the courage to say, 'We are going to get to that level of giving' without it." 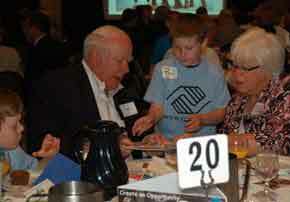 The Boys & Girls Club will soon be launching a capital campaign to fund building renovations or a complete remodel. When it does, the organization will certainly be able to get that new doorknob—and then some.